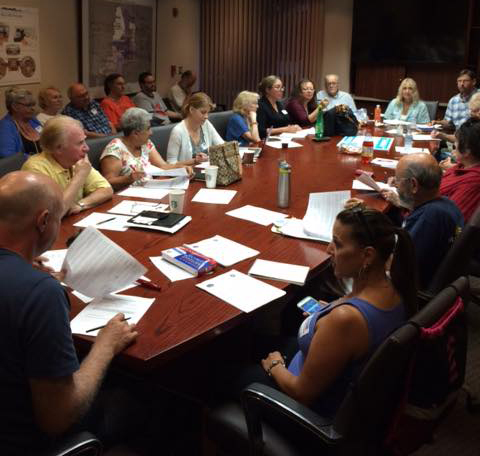 Twenty-one board members, as well as some non-board stakeholders, attended a special meeting of the West Hills Neighborhood Council on June 28 at West Hills Hospital. The meeting was called to ensure the Neighborhood Council was able to spend every penny of its 2015-2016 budget of $42,000 before the fiscal year ended on June 30. The minutes of the special meeting are here. This meeting was followed by two other meetings in the same room for the WHNC's Beautification Committee and Streets & Transportation Committee. It added up to a three-hour-plus marathon for those who stayed to the end. At the Beautification meeting, chaired by Tony Brosamle and Reeyan Raynes, the committee heard from members of the West Valley Garden Club, which meets monthly at Orcutt Ranch. They are seeking the Neighborhood Council’s endorsement of installing a plaque at the park honoring war veterans. The committee also set days and locations for its next Community Cleanups. Several residents of Royer Avenue spoke at the Streets & Transportation meeting (chaired by Barry Seybert and Tony Brosamle) to express their dismay and frustration about the recreational vehicles that have been parking on the street next to the hospital in recent months. Members of the committee provided them with contacts at the LAPD, the city attorney's office and other agencies to help resolve issues relating to illegal activities.